Charlie and I were purchasing our tickets to Japan and we thought... why not stop in Seoul? In my two years in Business School I got to be social chair for my section (J!) along with Seongmin, from South Korea, who became one of my best friends from my time in Harvard. So I had plenty of good reasons to visit Seoul: seeing my friend, and enjoying all her restaurants and sightseeing. Plus, we bought a direct Delta flight from Atlanta! 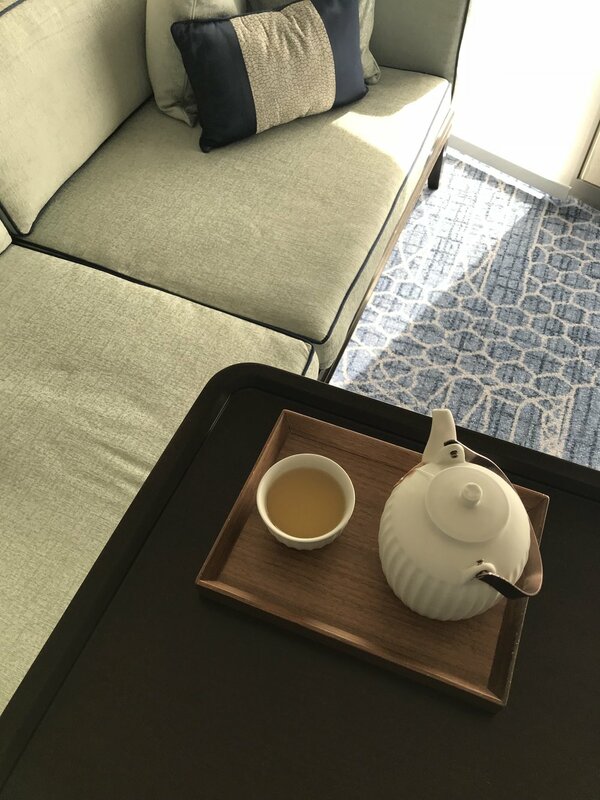 In this post I am sharing more about our hotel, day one and day two and some restaurants and bars. Day three, four, five and six coming up soon! We had a total of 6 days in Seoul: I knew we were going to have a jet-lag, so a great bed was a must! 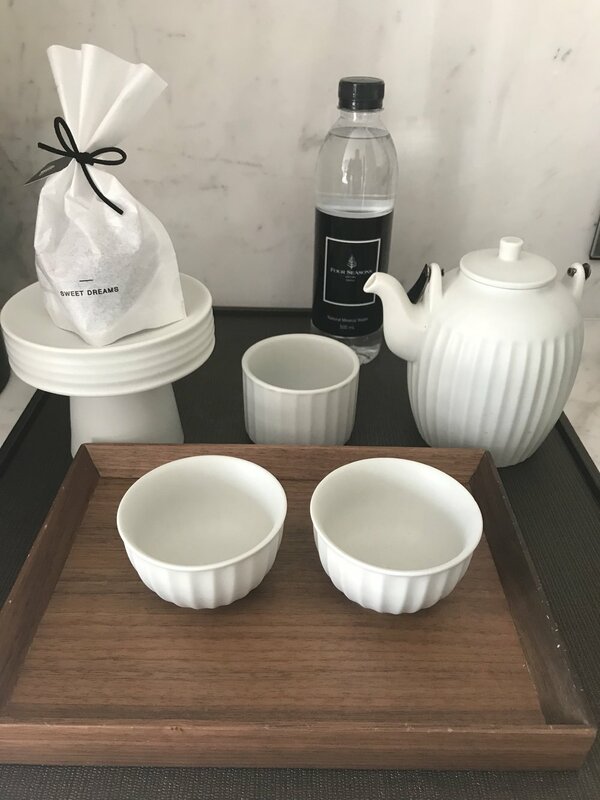 I chose to stay at the Four Seasons because, as you all know, I work in Hospitality, and I wanted to experience the level of service offered by them. 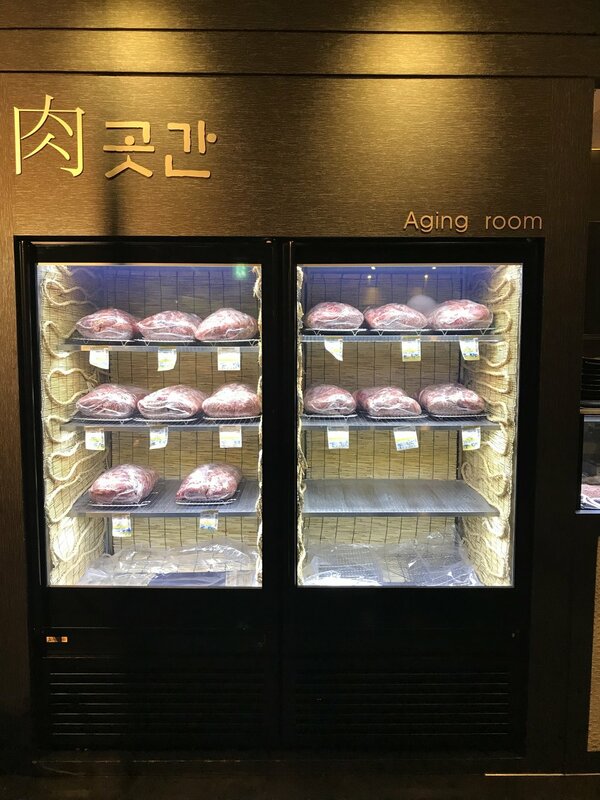 The Four Seasons was founded in the 60s and the property in Seoul is one of their newest. Check the photos below! The lobby is to die-for - it has flower arrangements from the famous Nicolai Bergmann and from the lobby you have access to all the restaurants. It is tricky to find Charles H., their speakeasy...but I guess that why it is called speakeasy. The gym was first-class. 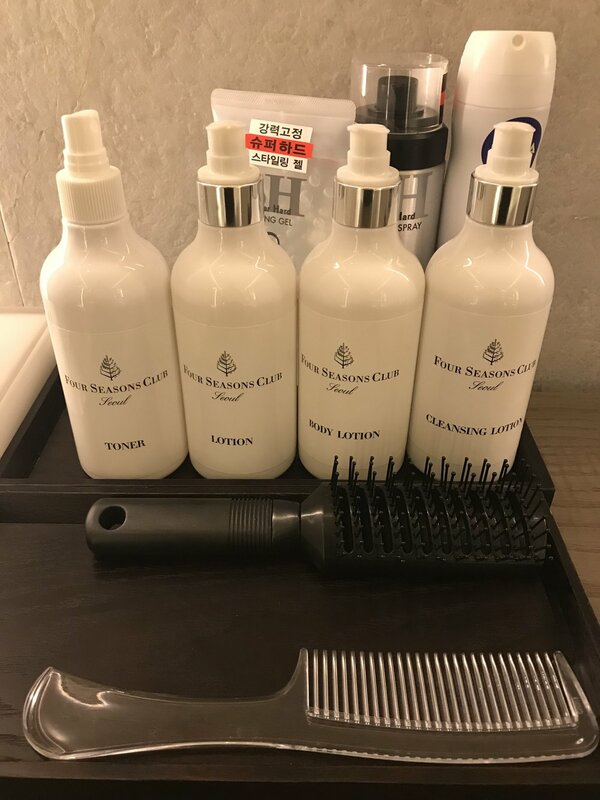 I don't know if you follow my Instagram, but I always post about hotel amenities - the gym's restroom had Four Seasons amenities (shampoo, conditioner, etc) and gym clothes available to guests in case you forgot yours! The bellman staff was also very helpful - they took us to the train station in their incredible Mercedez-Benz. VIP treatment! The Four Seasons Seoul was approximately $300 a night when we went, but Charlie had credit card points so we did not have to pay, which was awesome. I am happy I get to experience other luxury brands - there is always something to learn from my hotel stays. We arrived early morning in Seoul, and we decided to take a bus to the hotel. Not a smart choice because of the morning traffic! The best way to go to the city is definitely by taking the train - it is fast and super convenient - it is called Airport Railroad Express Train (AREX). If I am not wrong it costs $8 dollars per person to go from the airport to the city. We knew that we would be super tired, so we took a nap and then walked around the hotel area. We visited part of the famous Cheonggyecheon - a 10-kilometer long stream that was completely restored and opened in 2005 to the public. After walking during the afternoon we went to Wooga for dinner. Check out my post here about the restaurants / coffee shops I went to while in Seoul. Wooga was by far the best dinner of the entire trip! We joined a half-day trip to the DMZ - the Korean Demilitarized Zone. The tour was definitely one of the highlights of the trip. The Demilitarized Zone is a border barrier that divides the Korean peninsula in South and North and serves as a buffer zone between the two countries. The half-day tour included a visit to the 3rd infiltration tunnel, which was discovered in 1978 and is only 52km from Seoul. What was the most impressive part for me, though, was visiting Dorasan Station, the northernmost station in South Korea, 700m distant from the southern boundary line of DMZ. It was opened in 2002 and one day it is hoped that trains will be able to leave from here to North Korea and then to Europe. Nowadays, the only train that stops there is a train with tourists who came from Seoul to visit the DMZ. In the photos below you can see Charlie trying to see North Korea - you can actually see the "propaganda city" (a city where nobody actually lives) and another North Korean city when the day is clear - we were lucky that we could see both (photo on the right). On the bottom you can see Dorasan station and one of the bridges, that is not used anymore. After getting back from the half-day tour we visited Gyeongbokgung Palace, built in 1395, and Gwanghwamun gate, the main gate of the palace. We got lucky because we got there right when the Changing of Guards ceremony was about to start! Some friends recommended going to Gyeongbokgung if you have one or two days in Seoul - it was pretty impressive and I would definitely recommend checking it out. My favorite Palace, though, was not this one. In my next post I will share more about the impressive Changdeokgung Palace and its secret garden! Right after the palace we headed to Namsam Seoul Tower, to see Seoul from the top! The first stop is taking the cable car - I heard you can walk to the top, but we didn't have time, or physical strength to do so! I was still feeling pretty jet-lagged. When you get to the top the views are amazing! The cable car round-trip fare is approximately $9 and when you get to the top you have to pay $10 (if you want) to go up to the observatory level. We did not do it, because I felt that you could still see a lot from Seoul. After taking the cable car back to the city, we headed back to the hotel and went out for dinner. In the restaurants section below I am sharing more about the places we visited in the first 2 nights in Seoul. During the first days in Seoul we had the chance of going to awesome restaurants, all recommended by friends who lived in Seoul (thanks, Rosanna!) and friends who are from Seoul (thanks, SML!). Wooga: more about Wooga in my post here. Best meal of the trip! Sona: awesome dessert shop. I saw so many dessert shops there, and Sona did not disappoint! Apparently the champagne sugar ball is the go-to, but I ended up choosing a chocolate dessert. 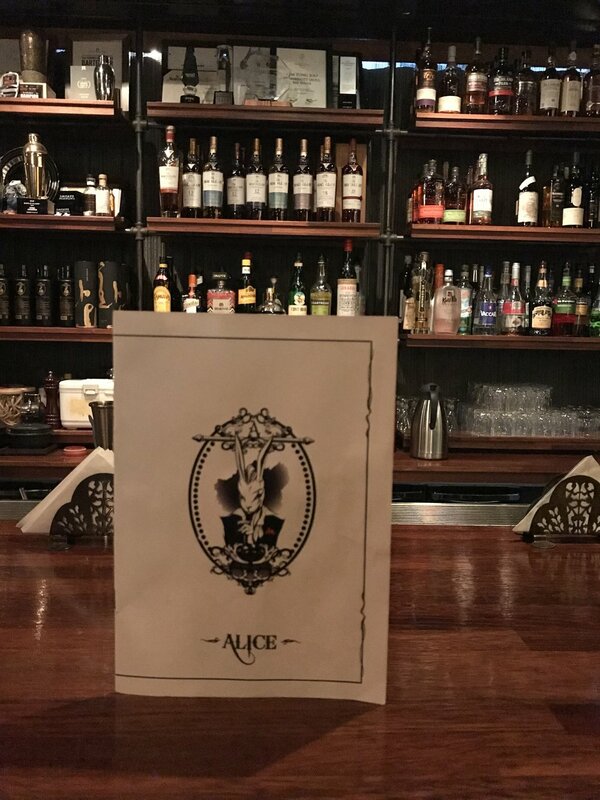 Alice: speakeasy bar - their drinks are the most creative ones I have ever seen. It is an Alice in wonderland themed speakeasy! Mukjeon: Korean food - order all the pancakes! Seafood, Kimchi...they are incredible! And don't forget the traditional drink - Makgeolli - rice wine.